Abandoned to erosion long ago, this road on Havre-Aubert (the southern island of Quebec’s Îles-de-la-Madeleine archipelago) ends abruptly at a rapidly deteriorating sandstone cliff. On the island of Havre-Aubert, grass and weeds grow through the cracks of a fractured asphalt road. 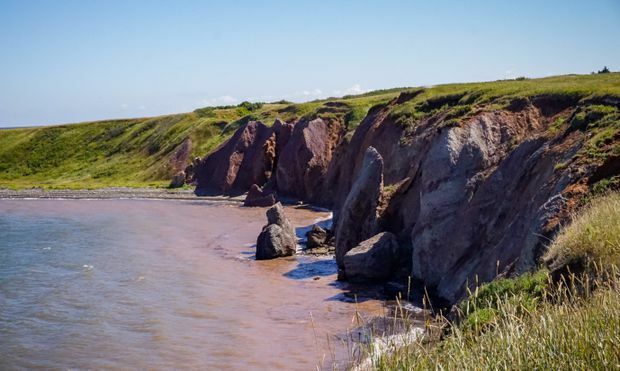 It’s the southernmost of the Îles-de-la-Madeleine, a picturesque archipelago about 150 kilometres northeast of Prince Edward Island. Abandoned years ago, the road disappears over a red sandstone cliff. Several huge boulders rest in the surf dozens of metres below; a resident of the neighbourhood says they fell last April. Asked how much of the cliff sloughed off each year, he smiled wanly. “Beaucoup,” he replied. Two cameras housed in rusty metal cases that hang over the precipice on a crude wooden gantry take snapshots every 15 minutes. They are the work of Pascal Bernatchez, a geography professor at the University of Quebec at Rimouski who has monitored Quebec’s coastline for more than a decade. He and his colleagues installed wooden stakes at 5,400 sites throughout the province to track the coastline’s movements, including 1,000 sites on these islands alone. The islands’ coasts feature a mixture of beautiful beaches, soaring cliffs of soft rock and loose material, rolling dunes, salt marshes and barrier beaches that join most of the islands together. Most of it is vulnerable to erosion under the best of conditions. Narrow beaches below the cliffs have shielded them from the destructive power of the waves in the gulf, but as those beaches disappear due to rising sea levels and warming oceans, the erosion has greatly accelerated. “It’s a good place to understand how coasts respond to sea-level rise,” Dr. Bernatchez said. 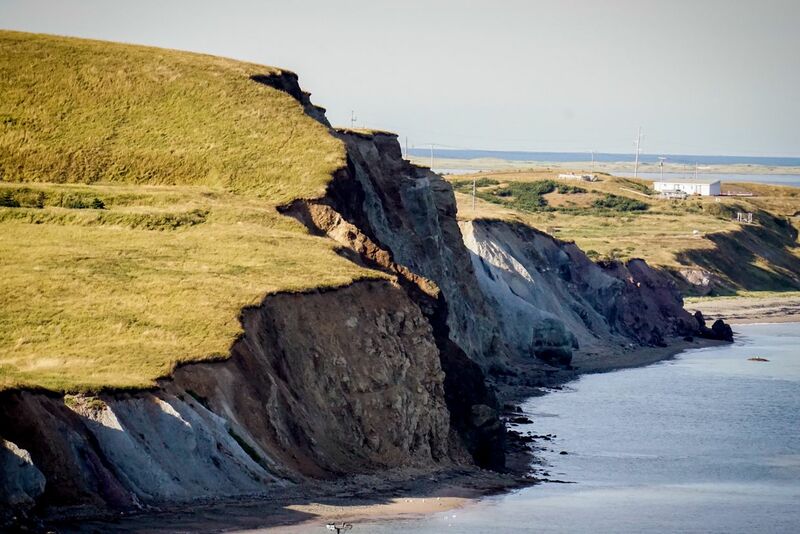 Rising seas and narrow beaches leave cliffs on Îles-de-la-Madeleine vulnerable to undercutting and block failure. These blocks fell from cliffs on Havre-Aubert during the spring of 2017. It’s also a good place to observe how people respond. This archipelago in the middle of the Gulf of St. Lawrence was first colonized by families from Saint Pierre and Miquelon who moved there after the French Revolution in the late 18th century. Although accessible via a five-hour ferry crossing from eastern PEI, they’re part of the province of Quebec. Tourists arrive in droves during the summer, effectively doubling the islands’ population. The dilemma facing the approximately 13,000 permanent inhabitants is not dissimilar to that of island countries around the world, from Tuvalu and Kiribati in the Pacific to the Maldives in the Indian Ocean, that already face an existential threat from climate change. As the water encroaches, island life will eventually become untenable. With the sea poised to wash the land out from under more roads, homes and buildings in the near future, Madelinots have difficult decisions to make. 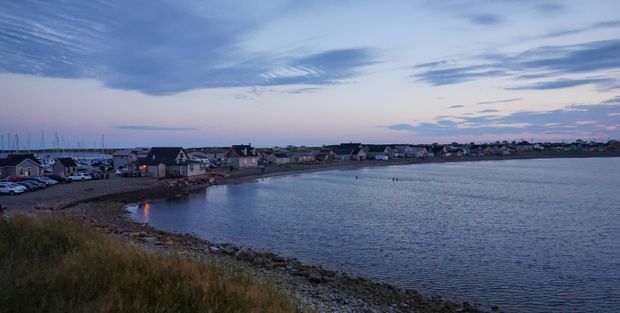 “We are the first to be affected, the first to live with this and have to adapt,” said Serge Bourgeois, planning director for the Municipality of Les Îles-de-la-Madeleine – and a man locals count on to lead the archipelago’s response. Their experience so far should disabuse other coastal communities of the notion they can simply throw boulders and additional soil along their shores when their time comes. 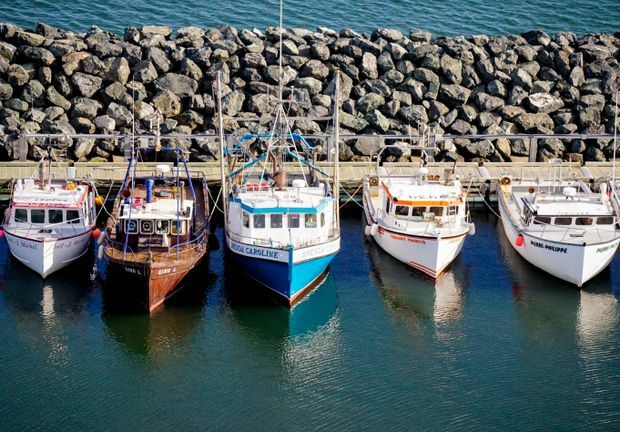 The municipality has invested millions of dollars in coastal studies, risk assessments and cost-benefit analyses seeking detailed information on what infrastructure the ocean will claim, and when. It has solicited advice from researchers such as Dr. Bernatchez. Yet their sparse population and small tax base mean Madelinots will have little choice but to surrender large swaths of their coastline to nature’s wrath and attempt to preserve only the most essential stretches of shoreline. Natural defences are few and dwindling. The Gulf of St. Lawrence is rising about 3.5 millimetres a year relative to the islands’ shores, faster than nearly anywhere else in Canada. Like much of the East Coast, the islands are sinking as the continent continues to adjust to the retreat of land ice at the end of the last ice age. Compounding matters, the islands are microtidal – meaning the distance between high and low tides is unusually small: less than one metre. This has produced the narrow beaches in some areas, and means low tide offers less of a buffer from storms. If projections from Natural Resources Canada for local sea-level rise are accurate, today’s high-tide mark could be the low-tide mark by 2100. In decades past, ice floes formed around the islands in January and lasted as late as May, protecting the coast from winter storms and tides. Warmer winters shorten the ice season, in some years eliminating it. Meanwhile, larger temperature swings produce freeze-thaw cycles that allow water to infiltrate cliffs, freeze and expand, fracturing the earth that holds them up. All this has already contributed to rapidly accelerating erosion. In 2008, Dr. Bernatchez and some colleagues concluded that by mid-century, the islands’ sandy beaches will have retreated as much as 80 metres inland; rocky cliffs will crumble by about half that distance. Dr. Bernatchez estimates that 70 per cent of their coastline is vulnerable to erosion, significantly worse than the provincial average. Madelinots have extensive experience using barriers to protect their shorelines, but the results have often disappointed--and marred the picturesque beaches tourists flock to in droves in summer. The world’s oceans have been rising in lockstep with global temperatures since the mid-1800s – and the pace is accelerating. In this five-part series, Sea Change, The Globe and Mail examines how Canada’s most vulnerable coastal communities are preparing for an inexorable force that will reshape their coastlines – in potentially catastrophic ways – for generations to come. Read Matthew McClearn's primer on the science behind this series. Madelinots already have extensive experience hardening their coastlines, but in many cases, it has only worsened the situation. Seawalls, for example, have a tendency to reflect waves back out to sea; that energy can move sand with it, causing beaches to vanish beneath the water. Elsewhere, land owners defended their shoreline with loose stone barriers known as riprap, but that caused erosion to accelerate on neighbouring properties, also due to shifts in wave energy. This line of defence is also costly. Rock and other materials must generally be transported from Nova Scotia. According to a study by Dr. Bernatchez and his colleagues, riprap here costs between $2,000 and $5,000 a linear metre; large stones cost as much as $8,000 a metre. Although defensive structures still litter the coast, gradual retreat inland has become a favoured solution for both homes and services. Mr. Bourgeois said roads, parking lots, hiking trails and observation points have all been moved back from crumbling cliffs. Some places will be abandoned. 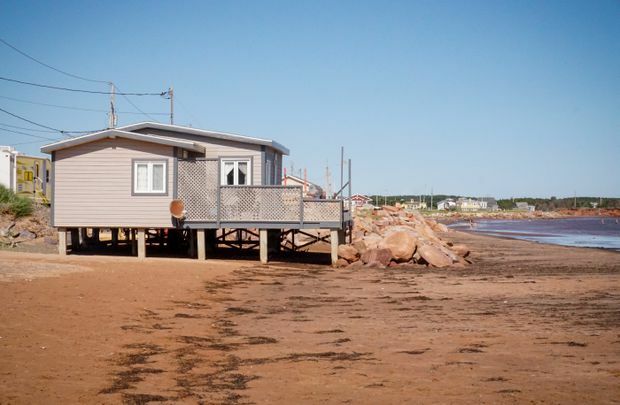 “With vacation homes that have less value, for example, little cottages, we’re not going to invest $15-million to stabilize bank erosion for properties that are only worth $2-million,” Mr. Bourgeois said. The municipality has identified several sites it does plan to defend. Near Cap-aux-Meules, a cliff face stands vulnerable to erosion. Commercial buildings, houses and a cemetery teeter on the edge of the eroding coastline. On the southeast shore of Île du Cap-aux-Meules, a group of low-lying homes has suffered flooding in recent years. A rock barrier protects this one, built on a pile foundation, from the sea. A building atop a rapidly-eroding cliff in Cap-aux-Meules. On a steep bluff overlooking Cap-aux-Meules’s waterfront are commercial buildings, the hospital and a graveyard just metres from the precipice. They are just a few of the estimated $107-million worth of houses, buildings and infrastructure Dr. Bernatchez and his colleagues predict erosion will threaten by 2065. This area contains some of the islands’ most important services, and much of the infrastructure is too big and complex to move. 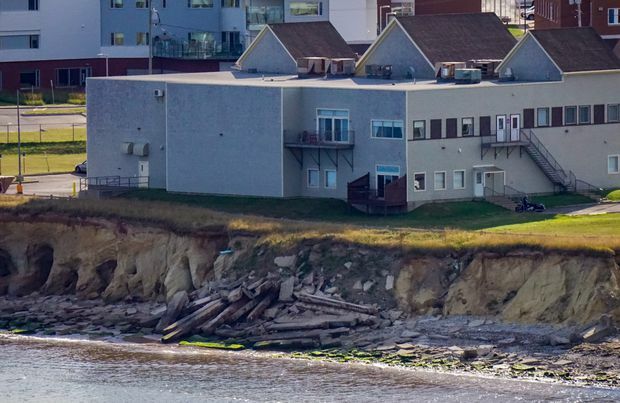 “For sure, we’ll have to stabilize the cliff because, of course, we can’t relocate the Cap-Aux-Meules downtown,” Mr. Bourgeois said. Another key site is La Grave, a quaint fishing village built along a half-kilometre of narrow, pebble beach on Havre-Aubert. Its small buildings contain restaurants, shops and galleries that rank among the islands’ prime tourist attractions. They are barely above the high-tide mark. It’s the site of the archipelago’s earliest settlement. Absent major interventions, it could be among the first to flood catastrophically. Elevating buildings on stilts is one option, but alternatives such as relocation or erecting a seawall have already been discarded. One option under consideration is to place vulnerable buildings on piles. La Grave, the location of the islands’ first settlement, is among the sites the municipality plans to protect. Built on a narrow pebble beach, it will be increasingly vulnerable to flooding as sea levels rise. Most vulnerable of the places to be saved are the barrier beaches (usually defined as a sand bar running parallel to the coastline and separated from it by a lagoon). Combined with other forces, rising seas threaten to sever these elegant sand tendrils as well as the bridges and causeways built to fill the gaps between them. 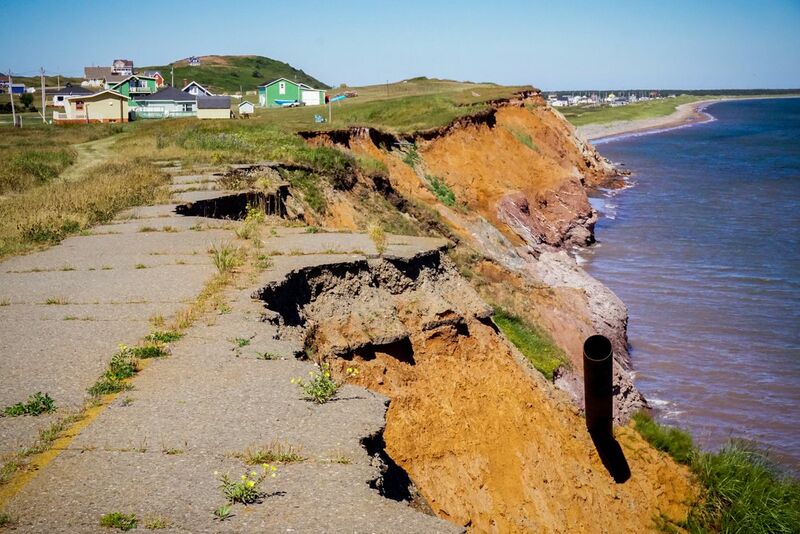 According to analysis by Dr. Bernatchez and colleagues, erosion will threaten 10 kilometres of Highway 199, which connects these islands, by 2065; municipal and local roads are also exposed. If these connections are severed, residents may have to travel between islands by boat, as they did in centuries past. 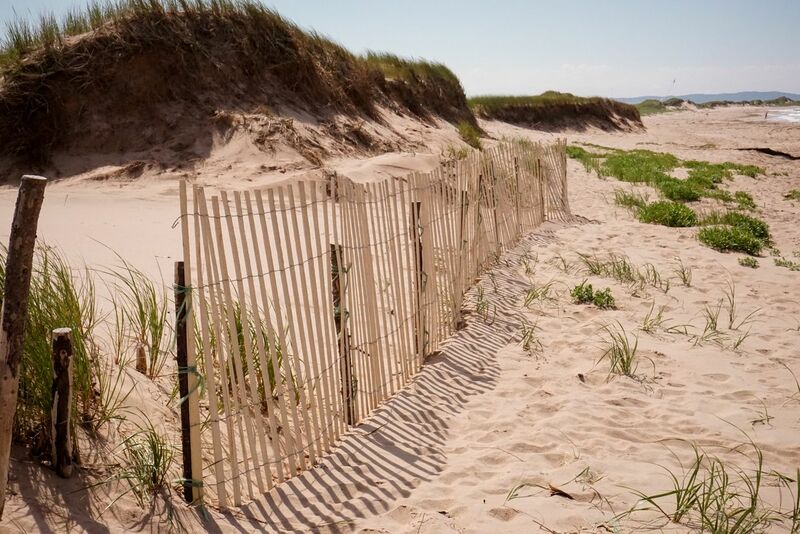 An environmental group on the islands, Attention FragÎles, protects the dunes every summer by planting beach grass and erecting fences that capture the sand. Madelinots are not quite out of engineered solutions. In recent years, the municipality increasingly favoured a technique called beach nourishment, which involves regularly adding gravel or sand to the shore. The sand that the sea washes around the islands happens to be among the few materials locally available in abundance, thanks to frequent harbour dredging. 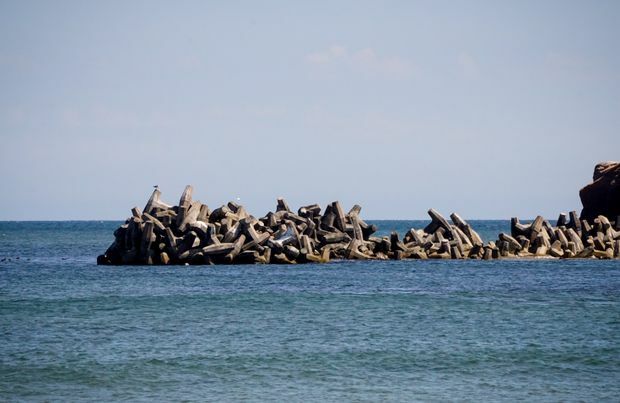 Dr. Bernatchez said groynes (rigid offshore structures that prevent sand and sediment from washing away) could help shore up segments of the western coast, where the effects of storms are the worst. Formerly a resident of Quebec City, Ms. Giroux met an islander during her university years, married him and moved to the islands. She’s now director of Attention FragÎles, an environmental group founded by islanders in 1988. Every summer, it dispatches small crews to restore sand dunes damaged by pedestrian and vehicle traffic. They erect fences that capture sand, effectively regrowing dunes. And they put in vegetation such as marram grass and sea-beach sandwort to hold them together. 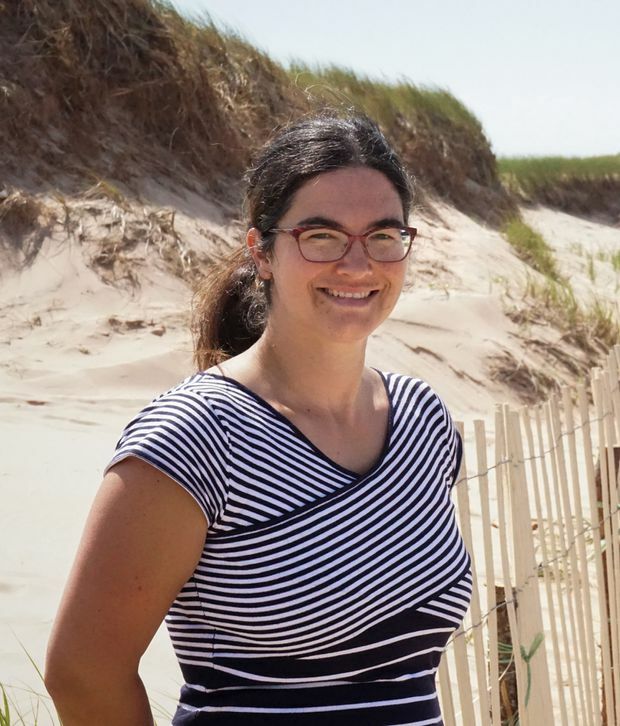 The organization argues that dunes absorb wave energy, thus slowing coastal erosion. They also protect the lagoons, which help supply the islands’ only source of drinking water − underground aquifers. The municipal and provincial governments are gradually introducing regulations aimed at reducing the archipelago’s vulnerability. Zoning regulations were amended in 2004 to prohibit construction within 30 metres of shore; that requirement was amended in 2016 to take location conditions such as soil stability into account. Erecting stone seawalls is now forbidden. Even so, some homeowners seem unable to resist the lure of coastal living. A mansion, one of the archipelago’s newest structures, sits on the southwestern shore of Havre-Aubert overlooking the Gulf. Anywhere else, it might seem a prudent distance from the cliff. Here, Dr. Bernatchez said, it is not. Madelinots tend to build farther inland, he said, in places sheltered from the wind. “They were aware of the problems because they were fishers,” he said. “Since 2004, we saw that many new buildings are really near the coast. It was people from Montreal, from Quebec [City].” Some of these newcomers may be in for a rude awakening: Vacation homes don’t qualify for relocation assistance. According to a 2016 report published by Natural Resources Canada, the islands are physically large and high enough to endure sustained erosion for many centuries. But their continued physical existence may not be enough. This reality has fostered some gallows humour among Madelinots. Fishing boats in a sheltered harbour on La Grosse Île, the northernmost of the Îles de la Madeleine.